Combine flour, sugar, baking powder, baking soda, and salt in large bowl. Add yogurt, milk, egg and oil; stir until smooth. Stir in rice and banana. Pour 1/4 cup batter onto hot nonstick griddle. Cook over medium heat until bubbles form on top and underside is lightly browned. Turn to brown other side. Serve hot with bananas and warm maple syrup. 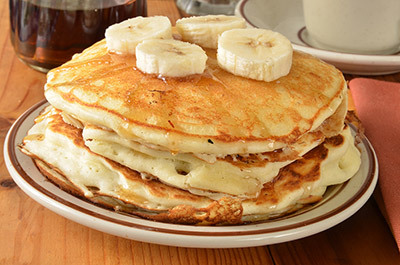 For Cinnamon-Banana Pancakes, add 1/4 teaspoon ground cinnamon to dry ingredients.